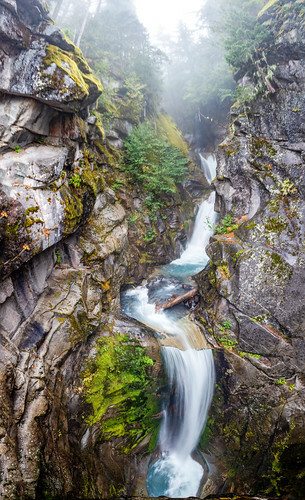 This angle of Christine Falls is not the one you normally see. I took this from the bridge very close to the falls, where the water drops straight down below you only a few feet away. There is a viewpoint down the road, but I decided to get up to the edge of the bridge, and shoot it top to bottom in a vertical panorama. 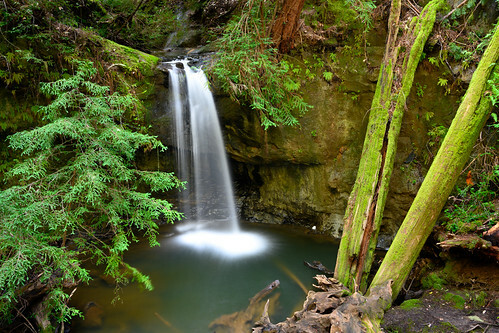 This distorts the height of the falls and makes it feel like it is snaking through the rocks in front of you. Normally this spot is accessible by car, but with 15 feet of snow falling in the last two weeks, Hwy 89 is closed. The good news is you can still get to the spot if you are willing to snowshoe. 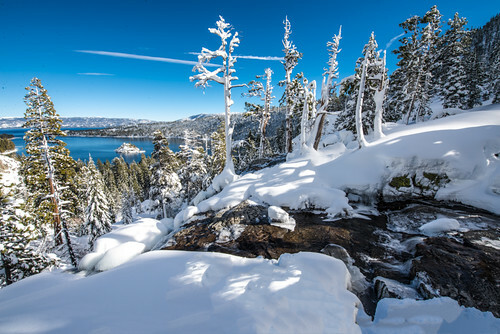 It doesn’t even seem like there is a highway there with all the snow, but after snowshoeing a couple miles you are at the top of Eagle Falls looking out over Emerald Bay.